The tables are set up in the greenhouse. We have scheduled a greenhouse training intensive for our student farmers on Monday morning, and our first seeding of the year will start the same day. Onions and scallions go first, and this year we’ll be seeding 59 trays of storage onions, 33 trays of sweet onions, 8 trays of scallions and 16 trays of shallots. All told that’s 14,848 plants that will be ready to go in the ground in April. We have certainly experienced a strange and mild winter this year. We’ve had a few cold days and nights, we’ve had some snow, but no long stretches of either. At a workshop last week I heard an attendee compare last winter, when things froze up and stayed frozen all winter, to this winter where things seem to freeze and thaw three times every week. Our skating pond has gone through just about every imaginable surface condition this winter, and we’ve only had a handful of truly good skating days. So I’m calling it ‘Spring all Winter’, and I’ve included a few pictures of our livestock enjoying a warm sunny day last week. One feature of spring all winter is winter rain, which can be a real challenge to livestock. Most of our animals do fine in the dry cold, but even the mosthearty can be challenged by temperatures below freezing when they’re wet. This winter has a been a test of our housing systems, and regular deep bedding has kept everyone pretty comfortable. We researched and built a new housing area for our dairy cows this summer, and this winter has been our first heavy use of it. Next week I’ll include pictures and a description of that process. Crazy winter weather has continued this week, with some of the coldest temperatures that anyone has seen around here for a long time. We set low temperature records Friday, Saturday at Sunday nights with -8, -9 and -14. Saturday night also featured 25mph winds, so things were pretty chilly out there on the farm. All of our livestock has a shelter to go into any time they want to, all winter, and we made sure to give everyone a deep fresh pile of straw to hunker down in before the cold really set in. Ducks, sheep and chickens are well insulated, cows and horses are big enough and operate hot enough that they don’t mind the cold too much, and the pigs burrow down into their straw bedding and snuggle to keep warm. Everyone came through well, and Tuesday it was fifty degrees and raining. The rain and melting snow really added up fast, and our farm was a wet flooded mess Tuesday afternoon. Drastic changes in temperature are hard on our livestock as they try to adapt to current conditions only to have those conditions constantly changing. 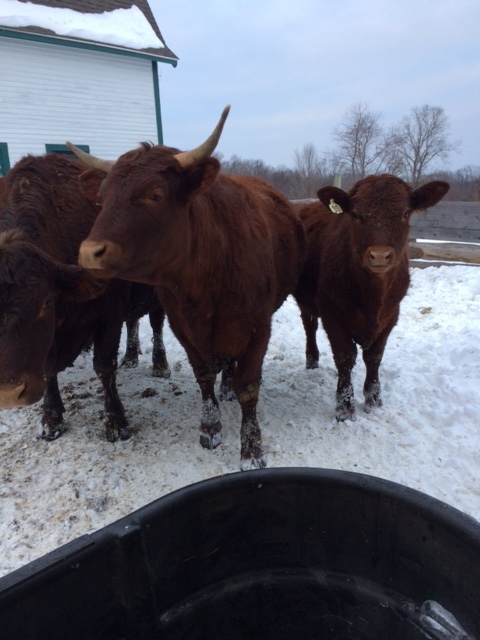 Our animals had dealt with a few days of super cold, then we had a twenty-four hours of warm and wet, and by midnight Tuesday night, we were back below freezing and all the water standing in the fields, roadways and yards turned to ice and frozen mud. I am a strong advocate against confinement livestock practices, but with weather like we’ve been having, I can see some of its appeal. We all got together on Monday for a whole farm project, clearing the edges of a single large pasture and processing 4+ cords of firewood from trees cut from the pasture perimeter. It was incredible to see the work we could all do working together for a full day, and the long term positive effect we had on our farm environment. We cleared fifteen or twenty feet of brush around the full perimeter of a 5 acre pasture, creating hundreds of square feet of grazable area in a single work day, and made Carlen a supply of firewood that will last her many years. I wrote last week about exposing the old stone walls again, and how nice it is to see them again so clearly in our landscape. This pasture has been finished now, and the effect of the full perimeter of wall standing out clearly again is wonderful. View from the top of the pasture. Our laying flock is still under pressure from a visiting hawk, with another two birds taken in the past week. Despite a ridiculous amount of strings, ribbons, cds and other flashing deterrents, as well as Hedwig the owl dummy, the hungry hawk will not be denied. We now have the layers closed in their house (not a situation they enjoy at all), and an d we have a huge net on order to string up. We’re trying to keep the hens entertained while they’re in lock-down, so we keep bringing them scraps, we add hay for them to scratch and peck through, and some of our adult student-farmers are working on a Broadway style song and dance routine to perform in the coop. There is a process for application for a permit to shoot birds of prey that are destroying livestock in the state of Massachusetts, with a burden of proof on the farmer that they have tried to drive the bird off by other means. We have certainly tried other means, and I am confident that we could get a permit to dispatch this particular hawk, but that is an option that I would like to avoid if possible. Birds of prey are, to me, the most incredible part of our New England landscape, and seeing them around our pastures and forests is always a treat. I often find myself driving our farm roads with my neck craned out, watching a hawk, falcon, owl or eagle glide over our fields scanning for prey, and those are some of my favorite moments on the farm. As I mentioned in the previous post, which was a lost episode that I rediscovered as I got things cleaned up for this effort to renew the Farm School Manual, I am planning on reviving this blog. My plan is to post weekly with updates from The Farm School, trying to cover as much of the work we’re doing as I can. I manage the livestock at The Farm School, so that area will take more of my focus than others, but I’ll try to report on everything that’s going on. Thanks for coming back, enjoy. You can see brush pile, a cleared section, and the rest. need to cut, and really do a thorough job of it. We are trying to take advantage of this opportunity to clear the persistent ten or twenty feet at the borders of seemingly every pasture, taking them back all the way out to the stone walls, and maximizing the space for growing grass. These walls are beautiful, and the work that went into creating them is mind boggling. Their re-emergence in the visuals of the farm is a wonderful added bonus, and feels like a nice nod to the farmers on this land before us. The timber frame is gone, time to cleanup for starting seeds. the soil bins move in, and all the sensors and record keeping supplies are installed. The greenhouse may have been the most dynamic and transformational addition to our farm over the past five years, and there are time in the year when it is the heart and soul of this whole place. Timber framers turn into lumberjacks when the frame is completed and cleaned up, and our yearly firewood production time is now upon us. We make 5 cords for neighbor Maggie, (Student farmers live and work at “Maggie’s Farm”) 20 cords for the outdoor wood furnace that heats the Chicken Coop School and Maggie’s Farm farm house, 20 cords for a similar furnace that heats the Bunkhouse at Sentinel Elm Farm (home of the Program for Visiting Schools), and 23 cords to heat staff housing cabins, sugaring wood and wood for the pizza oven. All together, that’s 68 cords of firewood, produced at various lengths to fit various uses. Our resident teamster Bradley uses the horses to pull the majority of the logs from the woods to our production yard, but we do buy some from a local logger to supplement the supply. 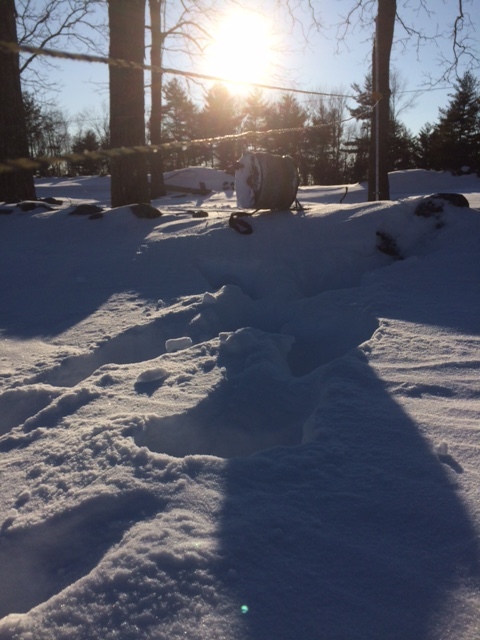 We had a bear visit our bee hives this winter, with quite a bit of damage. I wish that I had a picture of that to share with you. The hives have been re-enforced and protected in the hope that we can get the surviving hives through to warm weather and rebuild the farm population. Anne has setup an electric fence around the hives and strapped them down tight to their stands in the hopes that that will keep anybody from getting after them again. Livestock is in winter quarters all over the farm. The rams are still in with the ewes, making sure that everyone is bred. They will be sheared with the ewes in the first week of March, and then separated into their own fenced pen before lambs come. It is much easier to deal with lambing ewes without two rams getting involved too. That’s all for now. Next week I hope to report on the hawk that has been getting after our laying flock, more pictures and updates from firewood production, and everything else happening at The Farm School. I am going to make every effort to revive the Farm School Manual this winter, and to keep it going. In that effort, I discovered this old post, written last year in the depths of a snowy winter, but never posted. Here it is, I know that it brings back great memories of last winter, in contrast to the mild escapade we’re going thru this year. Enjoy, and look for more coming on a weekly basis moving forward. Thanks! The whole endeavor felt like what I imagine a walk in space to be like, deep in a hostile and alien environment, trying to accomplish simple steps made suddenly and implausibly challenging. But when I cut o pen a bale, and peel off the plastic wrapping, warm fragrant green grass, kept as fresh as the day it was cut by the tight wrapping, springs out like a portion of summer, right there in the middle of a field lost in the snow. The wind howls and swirls in my eyes, but I can see the summer that has past, and I can imagine spring.